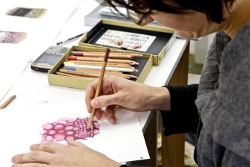 (1st module) -This hands-on course is aimed at giving the participants as broad as possible exposure to the basic elements of drawing and illustration. For those less experienced in drawing, the course will encompass important elements that are fundamental in the execution of credible drawing, both perceptual (observed) and conceptual (conceptualized according to a brief or story). For those with more experience in drawing, the course will serve as a revision of the basics and how your drawing skills can be applied in context. The illustration projects you will encounter will test your ability to apply your knowledge in different contexts according to the specifications of a brief. You are welcome to buy single sheets of A3 cartridge paper and A3 watercolour paper (four of each) to reduce costs. Session 6: Principles of grey scale watercolour painting: fineliner and greyscale (Black and white) watercolour applied to final storyboard drawing. Session 8: Basic principles of colour painting (Watercolour and Acrylic) Watercolour; acrylic painting of objects; Build up of tonalities, shadow areas and highlights according to the light source. Session 10: Self – Portrait – Conceptualize an image that represents your personality and interests. Drawing the image using reference material where necessary. (Module 2) – The second module which will take place two months after the 1st module is targeted at those who wish to tackle more advanced illustration projects that will give a broad taste of the projects encountered by illustrators across the publishing and advertising and design industry.